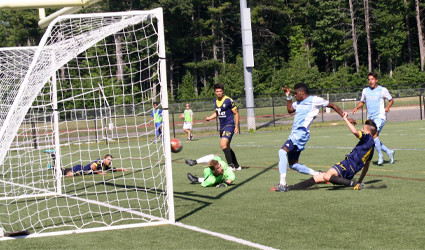 EXETER, NH - The Seacoast United Phantoms wrapped up their double header weekend with an emphatic win against FA Euro New York. The Phantoms only had 24 hours to recover from their end to end game against Long Island Rough Riders which saw both teams go home with a point. FA Euro New York experienced much the same on Saturday and were coming into the game off of the back of an impressive draw against GPS Portland Phoenix. From the moment the game kicked off, the Phantoms were on the front foot and looking to set the tone. The positive start paid off midway through the first half when Tiago Ewald picked up the ball and drove into FA Euro’s half finding Terrence Carter who guided the ball into the back of the net. The Phantoms had a couple more chances and the score line doubled when Andre Simmond found Willy Meizan who scored a terrific goal just before half-time. The second half ended the way the first half did with the Phantoms creating all of the chances. Terrence Carter and Willy Meizan combined on several attempts and the FA Euro backline was doing their best to keep the score line at 2-0. Some clever play from Tiago Ewald in the offensive third freed up Meizan who scored his second of the game. Just two minutes later and Meizan completed his hat-trick and the points were all but sealed for the Phantoms. Man of the match was an easy decision and goes to Willy Meizan but a special mention to the Phantoms backline and goalkeeper Andrew Pesci who recorded their third clean sheet of the season. The 4-0 win sees the Phantoms sitting third in the table and just four points behind league leaders Western Mass Pioneers. The Phantoms will look to close the gap when they meet the Pioneers on Friday at the Lusitano Stadium.